84. Human Resources Management: Training Employees To Stay Competitive – How to Shape Human Behavior. 00:00:29 Once the employee has been attracted, recruited, and hired they now perform and learn – for the rest of their life. Business, competitors, the market, products, technology, etc. is constantly changing, and employees have to learn and adapt constantly to this. Learning is a major factor for a compay’s competitiveness. 00:04:10 As an employer, how can you be sure that what your employees learn in training really transfers into real life? 00:05:00 People’s way of learning has changed. It no longer makes sense to memorize things like it did years ago. Now, you have the entire world of knowledge in your pocket. The question is learning how to leverage the internet and your social networkds to benefit from them at any point in time for any problem in time. 00:06:50 Knowledge, Competence, Talent, & Intelligence. Having knowledge doesn’t necessarily mean that you can solve problems. Knowlege is a very important basis, but problem-solving comes from experience, practice, and reflection. Competence means that you are able to solve problems. You can read how-to books and memorize the ‘50 things you need to…,’ but that doesn’t make you competent. 00:09:29 When do talented people acquire talent? At the early age of two, Tiger Wood’s father saw talent in Tiger’s swing, and he fostered it. But when did Tiger actually acquire this talent? At the point of conception when his DNA was defined. This is the idea of talent and intelligence; that you are genetically pre-dispositioned to have to the potential to excel at something if it is identified, detected, and leveraged. Malcolm Gladwell, in his book Outliers, points to 10,000 hours needed to become a professional. But if you are not naturally talented at something, you are probably not willing to spend 10,000 hours in doing the practice needed to become a professional. 00:14:15 Some things you can change through training, other things must be developed through experience; some things cannot be changed at all. 00:14:51 Training is a big business; many companies have internal training departments dedicated to improving their employees’ professional competencies, behavioral skills and techniques and methodologies. These trainings are offered as long as employees ask for it. 00:22:10 Onboarding is the process of quickly getting new employees up to speed with how the company works and how they can most effectively do their job. 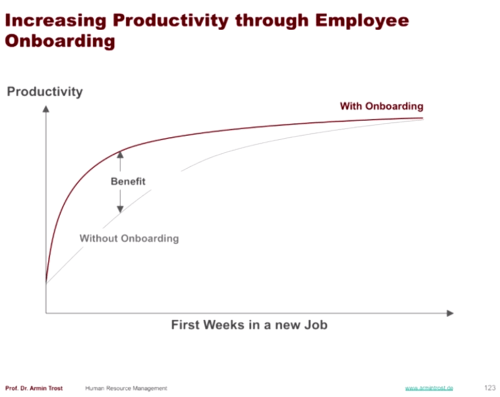 Without onboarding, productivity at the beginning is stifled and more than normal mistakes are made. 00:34:00 Unconscious incompetence is not knowing what you don’t know. From where you are currently, you cannot tell what your needs are; you must first reach a certain level of competence for you to understand what you did not know in the past. Therefore, with onboarding and other needs-based trainig systems, you cannot ask newly-hired what they need because they can’t tell you want they need. Design a training program that best meets those needs. Evalute how well the training program has met the pre-defined needs. Unconscious competence is knowing how to do something well, but not knowing how to tell others to do it. 00:42:55 On-the-job training is good because you learn something relevant and then can immediately apply it, so learning transfer is most efficient. Off-the-job training tends to be away from the office environment in a more professional learning environment with professional coaches not usually available to you on-the-job which allows you to just focus on training. 00:51:56 Blended learning involves combining different learning techniques to create one well-rounded and comprehensive training program. Reaction: Did the participants respond positively to the training? The problem with this sort of evaluation is that the responses will be subjective, the trainer can manipulate the participants into positive evaluations of the training, and there is no way to ensure that the participants learned what they needed to learn. Learning: Did the participants acquire the knowledge intended during the training? Tests can be conducted to ensure the information was learned. Behavior: Have the participant’s behavior changed positively since the training? Monitoring and job-shadowing can ensure the information was assimilated and applied. Results: Did the training program meet the organization’s goals? Have the participant’s behavior really improved revenue? 00:58:50 Learning transfer is how much of what is learned during a training is actually applied. The training only pays off if the participants apply what they have learned. Attend trainings out of curiosity and without expectations and to take advantage of free time away from work. Are comfortable with their old habits and just don’t want to/can’t change, no matter how much you want them to. The training must offer the participant the possibility to apply training. Show participants how the training is important to them and how it will make their lives easier. 01:05:09 Learning in companies, and the way employees acquire knowledge, has dramatically changed in the last few years because the environment has changed – the internet, social media, etc. 01:05:46 Informal learning is improved performance just just happens through experience, trial and error. 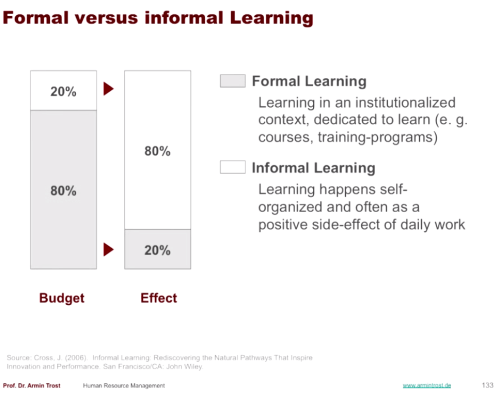 Formal learning is improved performance that happens through an institutionalized context. People primarily learn informally. The dilemma is that 80% of a business’ training budget yields only 20% of learning. The remaining 80% of the person’s learning happens informally. 01:12:01 Today, things have become so complicated these days and projects become so complex that people work with their brain and become ‘experts’ in their particular field, and will know much more about their work than their immediate manager. Managers typically cannot possibly know everything, therefore must have a broad knowledge of things under them and are surrounded by experts who spend most of their time learning from each other rather than from their boss – peer learning. 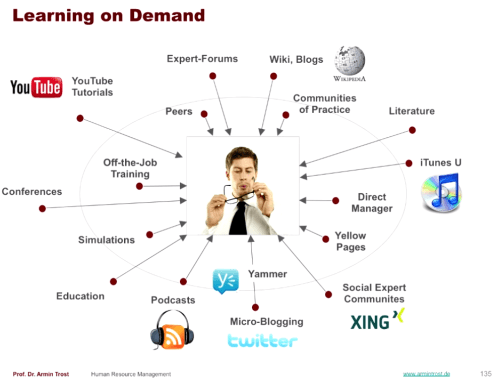 Posted on March 18, 2015 January 17, 2017 by Joshua SMITHPosted in videosTagged Armin Trost, competitive advantage, employee management, hochschule, human behavior, human resources, onboarding, videos, youtube.